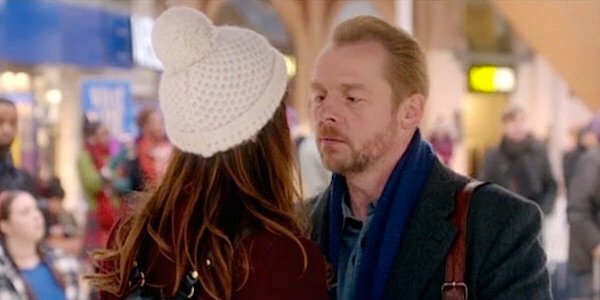 There may have been some worries as to whether a romantic comedy starring Simon Pegg and Lake Bell would be a good idea or not. But with the first trailer of the duo's latest film Man Up having dropped, most of those worries can now be put to rest. The new trailer, which you can view below, has many elements that could make it one of the best rom-coms to grace our screens in years. This is writer Tess Morris' first sole feature screenwriting credit. As for the director, Ben Palmer, this is his first feature film since his 2011 flick The Inbetweeners, based off his TV series of the same name. With that said, there isn't much to go on as far as a film track record for either, but from the looks of the footage here, it appears they have gotten the job done... potentially even done very well. The upcoming rom-com certainly looks to have been shot well, much thanks to film's cinematographer Andrew Dunn, known for his work on such films as The Perks of Being a Wallflower and Precious. While I'll admit I wasn't prepared to hear Bell speaking with an English accent, it very quickly became a non-issue only seconds into the trailer. Another thing that caught me off guard, however, was learning Edgar Wright had nothing to do with this film. Here I thought the action director and frequent Pegg collaborator had decided to tackle a new genre—a passing moment that actually got me kind of excited. All complaints aside, the above trailer looks quite promising. It's difficult to say from the clip how funny the film will be, but it doesn't appear to be selling too hard on "laugh out loud" moments but rather billing more as a lighthearted indie feel-gooder. And on that note, it could prove to be a winner. Working in favor of the film are its lead actor and actress, Simon Pegg and Lake Bell. You never quite know what kind of chemistry two actors are going to have until you see them interacting onscreen. There usually isn't a whole heck of a lot of room for a mediocre pairing—they've either got it, or they don't. In the case of the Shaun of the Dead actor and his New Girl co-star, thankfully, it seems to be a rather good matchup. From the moment they meet in the trailer with Pegg doing his typical nice guy routine as he attempts to greet Bell with a kiss, it seems as though the two have a nice spark. Man Up hits theaters on May 29. What do you think of this first look?